We are often asked ... "Do you do repairs of other company's products?" Unfortunately we hear this all to often. The answer is: Yes, we do repairs on other company's products. Some repairs are due to plain old worn out products. Let's face it, it happens. Nothing lasts forever, right! Yet, many of these products should actually be lasting longer than what we see. Many homeowners try to "go the cheapest possible route". Remember the old adage: "if it sounds too good to be true, it probably is", or "you get what you pay for". We see homeowners who decided to buy a product from one company because it is a couple hundred dollars less then another company, only to find out that the reason why is was cheaper is because of the quality of the product, or maybe it was cheaper because it was missing parts. These repairs to correct the few hundred that was initially saved, costs much more to fix depending upon the damage that was caused. We greatly minimize these calls by providing the best products on the market! We know how they are suppose to be built and installed, and we make sure they are! However, some repairs are due to improper installations. These are sad because we see just stupid mistakes as part of these installations. For instance, the pictures to the right. All of these pictures are from the same house, installed by a certain shade company in Denver. This company blamed the manufacturer of the shades, however when the manufacturer called us to check out the problem we found it was not the shade, but how it was installed. The Denver located shade company used subcontractors who apparently did not know what they were doing, every single side rail for the shade the subcontractor had cut too short. The first two pictures were the same shade, each side was cut different heights, and none of them even come close enough to the housing unit for the shade. Now we have another homeowner (on the left). This was yet another poorly installed shade, by the same Denver located shade company as the job above. Again the subcontractor installed the rails incorrectly. The homeowner told us that since day one the shade never worked correctly. The homeowner said that the owner of the Denver located shade company told them that the shade was poorly made and that there was nothing they could do. The manufacturer asked us to go look at it and we found that, again, it was incorrectly installed. After we fixed it, the homeowner has never had a problem. Then we have a certain Rolling Shutter dealer in Colorado Springs. These people have been in business for awhile ... however I have no idea how they made it this long. We do so many repairs from them. 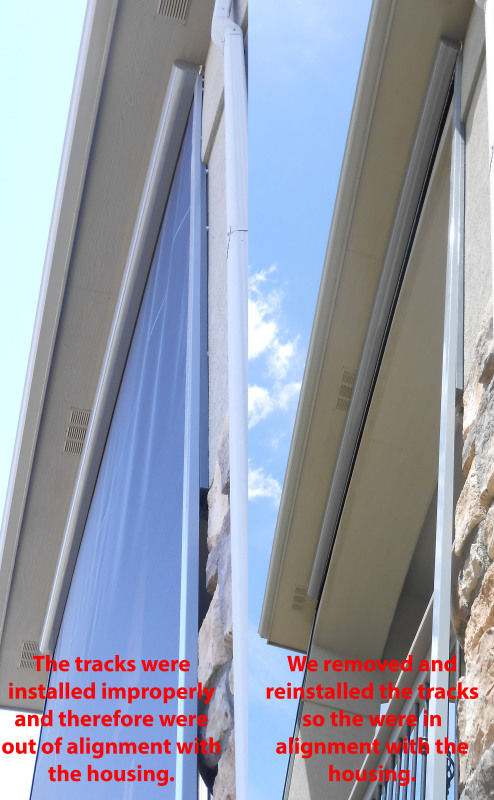 This homeowner bought a rolling shutter from this company (on the right). This company claims that they are 100% German made. So we looked into what happened with this shutter. 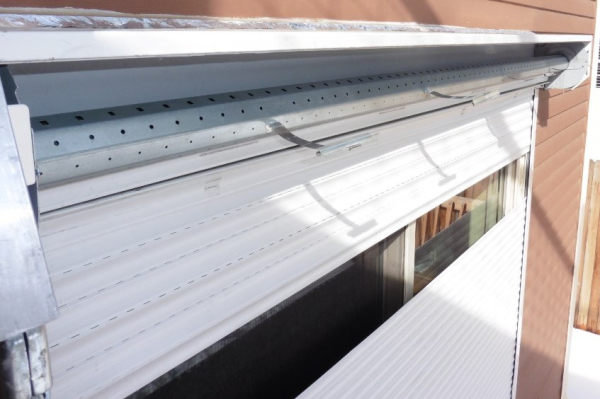 We first noticed that inexpensive parts had been left off the manufacturing of this shutter. The lack of these parts had causing the shutter curtain to catch on the housing and rip the curtain off the shutter damaging many slats of the curtain in the process. This is not surprising as we see this all the time with those companies selling cheap products. Next, the homeowner had programming issues of his remote. We looked into this problem and noticed it was a chinese motor and control (in this 100% German made product)! We could show tons of improper installations and poorly made products ... the point is, we can repair what was not installed properly or made improperly.